It's heavy and very close to square. A few minor flaws are evident but they'll be hidden on the sides by cabinets for the most part. 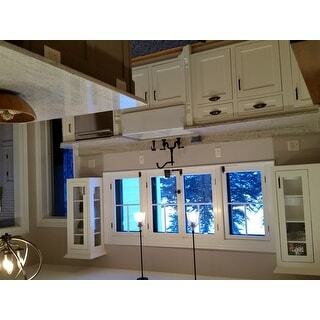 Seems well-constructed and should be a good point of focus in new kitchen. Add style and function to your kitchen with this double-bowl farmhouse sink from Highpoint. The sink features two equal-size bowls to provide two separate areas for washing dishes or doing food prep. 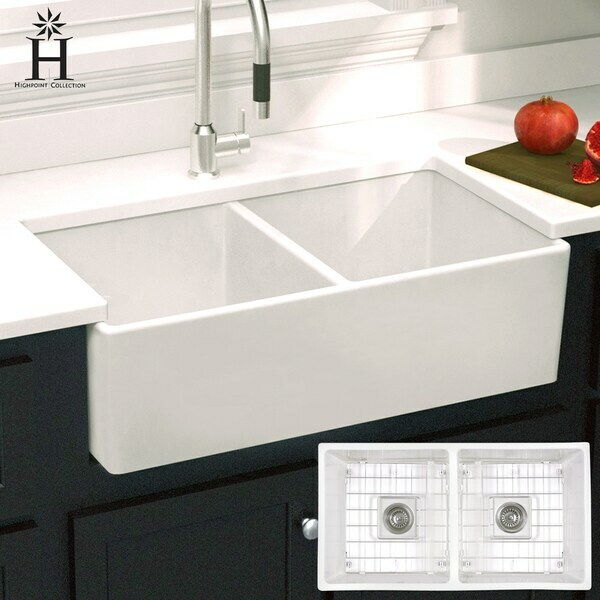 The sink is constructed of heavy-duty fireclay with a polished white finish, which adds a classic look to your kitchen and comes complete with chrome-finished drains and grids. Fireclay sinks will show small cracks on the underside of the sink. This happens during firing and do not go through, having no bearing on the performance of the sink. High-end sink @ great price! Beautiful, modern high end sink at a great price! 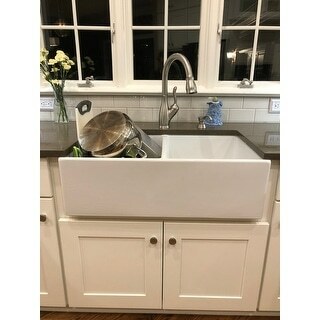 I shopped all over to find a Fireclay white double-bowl farmhouse sink that had deep bowls but wasn't $ (like my previous one). This is perfect! Added bonus that it comes with sink grates. Delivery easy &amp; came in perfect condition (nice padding protection/box). I can't wait to install it in my new kitchen! Beautiful sleek sink. Easy to install. I searched for a farmhouse sink with a deep apron for awhile for our new kitchen renovation. This sink was priced well and below the main competitors including Lowes and Home Depot. I did not know this brand however it's very high quality and it looks fabulous. I based my faith in this purchase due to the high reviews and stars. I choose a divider in my sink because I wash so many dishes and wanted separation. I love this sink and would recommend to any friends! I've been searching several websites and in local stores for a good double bowl farmhouse style sink. I found this one on Overstock and couldn't believe the price. When it came, I was extremely pleased with the look of it and that it came with the drain boards for protection of the bottom of the sink. I recommend this sink to anyone. Love this sink. Packaged well. Nice deep bowl. Received the sink. It's beautiful. Love the color. It was hard finding a double farmhouse sink that was equal sizes on both. I purchased a Moen faucet to complete the look of this beautiful sink. I would recommend you purchase the sink before you have your custom cabinets built. Looking forward to seeing everything put together. I would definitely recommend this sink to others. Our first sink arrived late and was damaged beyond repair. Customer service was wonderful to work with and a replacement was shipped out to us within 3 business days. The replacement arrived a day late "due to weather issues" and was in perfect condition. Please note that this fireclay sink is very thick. We had an issue with the sink drain for the garbage disposal that was included with this product. You will need to purchase an extended flange disposer/trim basket strainer for deep fireclay sinks. I love this double bowl farmhouse sink. It is perfect and very well made. It is great in my new kitchen. High quality materials. Looks just like image in add. So pleased with purchase. this sink is very well made and very strong and heavy. It looks great in my kitchen. This sink came very well packed I was worried because the outside box was dented and torn. But when I opened it it was fine. I am very pleased with the look and it is very heavy will not be able to see it installed till our home that we are building is ready for it. Can't wait! I love my sink. It was just what I was searching for. Just as picture. Haven’t installed yet so not sure how hard that will be. It’s true white. Very heavy so be prepared. It’s very large so make sure to measure accurately. A lot of farmhouse sinks were 30 and this is 33”. Very heavy and quality piece. Very impressed by the value received for the relatively low price compared to other farm sinks. Very well made and clean lines. I love the look of this sink. Has not been installed yet. 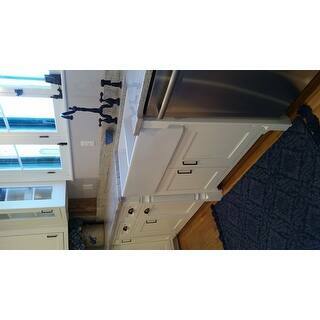 "I purchased this sink last year but the renovation was delayed and are putting it in soon. It did not come with the grids and I wonder if you have them to purchase yet?" "I ordered this sink a while ago but it is just getting installed in my new home and One of my grids came without one of the rubber feet. Do you know how I can get one?" "can the grids for this farmhouse sink be purchased separately. Thank you for your assistance." Unfortunately right now we only sell these grids included with the sink and packed one for one with the factory. We are in the process of having additional grids manufactured but they are not available yet. Please check back in 5-6 months time. I hope this helps. "Can I purchase another set of the grids for this farmhouse sink? If so can I please order another set of the grids? Thank you"
Unfortunately right now we only offer these grids included with the sink and packed one for one at our factory. We are in the process of having additional grids manufactured but they are not available yet. "Hello, how much does it weight?" This is about 110 pounds. "Love the sink but need Oil Rubbed Bronze Garbage disposal drain and regular sink strainer. Can you please provide me with the correct product to purchase that is compatible with this sink and with Sears brand disposal? Thank you for your assistance"
"Says in stock when search, then says out of stock when I go to pay? Please get back asap need sink now. "